If you're ever feeling bummed, Amber Wagner is your cure. As @jstlbby — which stands for "Just Livin' Baby" — the 27-year-old has made a career for herself out of being positive and sharing proclamations of self-love, body positivity and unapologetic confidence with her 1.6 million followers on Instagram. With her contagious energy and off-kilter personal style that includes her signature sparkly turbans and four-inch neon nails, the Los Angeles-based social media star-turned-motivational speaker is exactly what the Internet needs: an authentically real voice spreading love and acceptance in a sea of hate-spewing social media trolls. But life wasn't always so positive for Wagner. "I used to be ghetto, and ratchet, and just not a good person," she explains. "I went through a really bad breakup and was in a really dark place for a long time. That's when my mom told me to get back into church. Once I did that, my life started changing and I started doing videos to show people, 'Hey, trouble don't always last.'" In 2016, she finally decided to share one of those videos on Instagram, and things took off from there. Watching one of her videos can almost feel like watching a sermon, with each follower's like or ebullient comment akin to a congregation member's "amen!" "Honestly, I didn't expect any of this," she says about the massive response she's garnered from her confessional videos, of which Rihanna is a fan. "But I think people just like seeing something different — someone putting themselves out there. So many people on social media are like, 'Oh my life is great,' but I'm sitting there telling them 'Hey, I just got dumped, but you know what? I'm still standing.'" It's that bracing honesty and unhindered positivity that's made @jstlbby one of Instagram's most refreshing profiles. And unlike a lot of other popular social media personalities, Amber Wagner is the real deal. When I call her up, she's hungover after a night of "getting too lit," but she's in a remarkably good mood, almost surprisingly so. That's when I realize she's not confident and positive for the likes — she's @jstlbby IRL. "When I'm doing my videos or posting comments, all I can be is me," she says. "I'm the same person all day — on and off the Internet." Part of that persona is also Wagner's style. 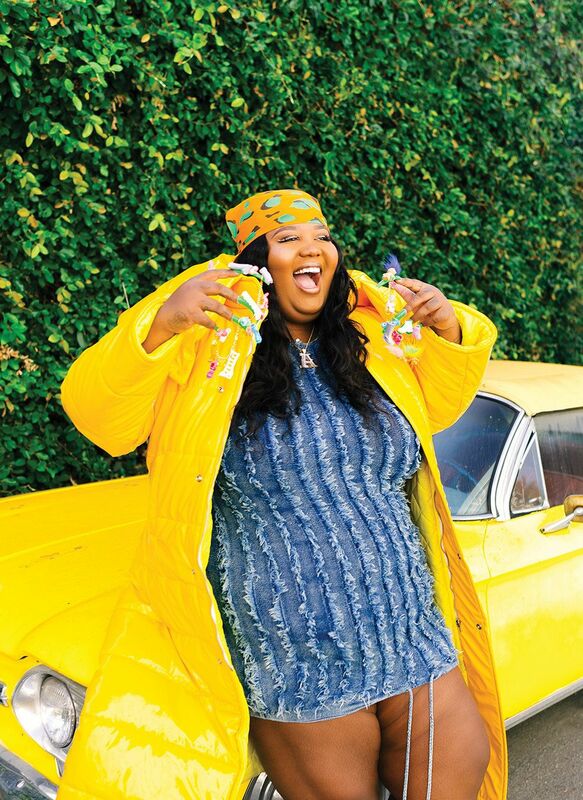 Whether she's wearing a bikini at the beach, showing off her curves with her hair in a turban; a sheer dress and a curly weave at the club, or her pajamas with no makeup at home, the California native adamantly preaches self-love at any size. "Anybody can be beautiful any time," she asserts. "You're as beautiful when you go out as when you wake up. Beauty is just who you are and how you see yourself. It's what you make it. It's not a face full of makeup or being a size 2." "Beauty is just who you are and how you see yourself." This self-assuredness is all part of Wagner's ethos of empowerment. Though, that doesn't mean she doesn't have her share of bad days. "I'm just a regular human being like everybody else," she says. "I definitely have my own problems. I just try to push through them and remind myself that everything is temporary. So, even when I'm sad, I'm happy, because I know the darkness will pass soon." As a firm believer in the idea that "everything happens for a reason," Amber keeps herself going by remembering who she is: "motivational, funny and ghetto." And while other people may look to social media for fame and followers, she uses her platform as a place to "inspire, encourage and love." "Just to know that a regular person like me can help so many other people with their problems and their confidence — there's nothing more reassuring" she says. "People tell me, 'I wake up and go to your page. I watch your videos every day.' So, I know what I'm doing is needed — and that it works. That's really powerful."